We recently spent most of two weeks in the Netherlands, where we rented bikes to use as our primary transportation. The house where we were staying was just a little too far from anything, and we really didn’t want to deal with moving a car about or installing carseats for the kids, and I hear people cycle in the Netherlands anyway, so bikes it was. And what a joy it is to bike in the Netherlands! The first day there we walked into Delft, and I was intensely jealous of all of the families I saw cycling along the canals. A few days later, we were one of those families. It was so nice to be in a place where biking with one’s kids is normal, not something that those weird people do. We saw many people biking with an empty kid seat on the back. It’s just what you do there. Apparently it’s not so normal to rent bikes for an entire week. We walked into the bike shop in a pouring rainstorm and announced that we’d like to rent some bikes, and the fellow there said, “In this weather? Are you from Vancouver Island or something?” which is not so far off. But once we had them we were able to go everywhere, and the weather was mostly fine. We rode around Delft, but we also rode to the tram stop, and to the train station, where we’d catch a train to, well, anywhere (mostly Amsterdam, with train service every 15 minutes)(15 minutes!). Really. That was our train station. Our 6yo mostly biked herself around. It’s easy – most of the bike paths are separated from motor vehicle traffic, and for those that aren’t, the intersections are protected. And the signals! They automatically sense bikes, and have a separate light for the bike, but if the sensor doesn’t catch you, there’s a button placed with easy access for cyclists. So easy. The wheel locks that are built into Dutch bikes are really handy. I want to put one on my bike here. The mamafiets was amazingly easy to ride. I’d heard that Dutch bikes are heavy, so I was a little nervous about biking my babies around without electric assist, but this bike was significantly lighter than what I ride at home, so no problem. We loaded Mark’s bakfiets down with all the gear. The step through frame makes a huge difference in the ease of getting on and off while loaded with kids. It rode smoothly and easily. It’s no joke that the Netherlands is flat, and that flatness is part of what makes cycling work. The biggest climbs we found were manmade. There was the climb out of the train station parking garage, and one day we rode over a motorway. Speaking of the route out of the train station: did you note that the path goes right along the canal? And that there are no barriers? That did make me a little nervous, but nobody rode into the canal, so all is fine. Bikes allow for some sprawl. Housing that’s not walking distance to anything still can work if you have a bike. This means that communities don’t need to be as compact. But the Dutch are very efficient, so even the suburbs are fairly compact, as suburbs go. It was about a mile and a half to the grocery store, and similar to the train station – too far to walk, annoying to drive, but easy on a bike. 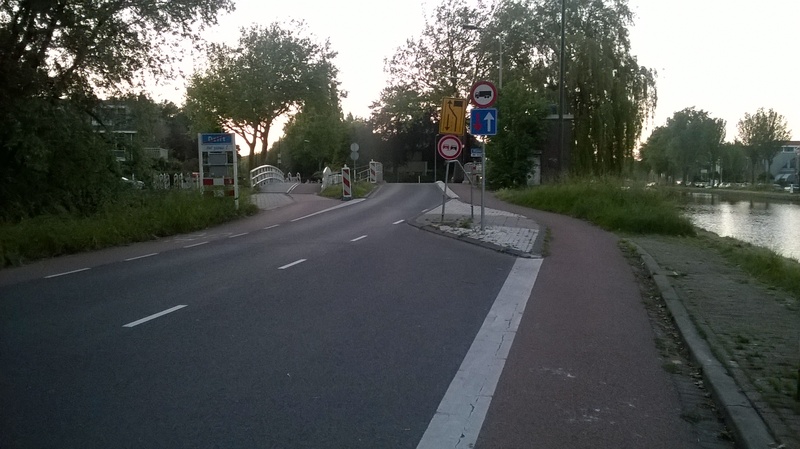 It’s easy to bike in the Netherlands. It’s flat, the streets are safe, and it’s perfectly normal.